Wine red velvet with gilded clasps. Gift of Mrs. Alexandre P. Rosenberg in memory of her husband Alexandre Paul Rosenberg, 2008. Queen Claude de France (her arms on folios 6r, 15v, 18v); H.P. Kraus; bought by Mr. Alexandre P. Rosenberg from Kraus in the late 1970s (Ocelli nominum: Claude de France prayerbook). Ms. prayer book; written and illuminated in Tours, France, ca. 1517. Decoration: 132 miniatures; the narrative scenes overlapped in trompe-l'oeil by placards carrying the text and almost all framed by the Franciscan cordelière. 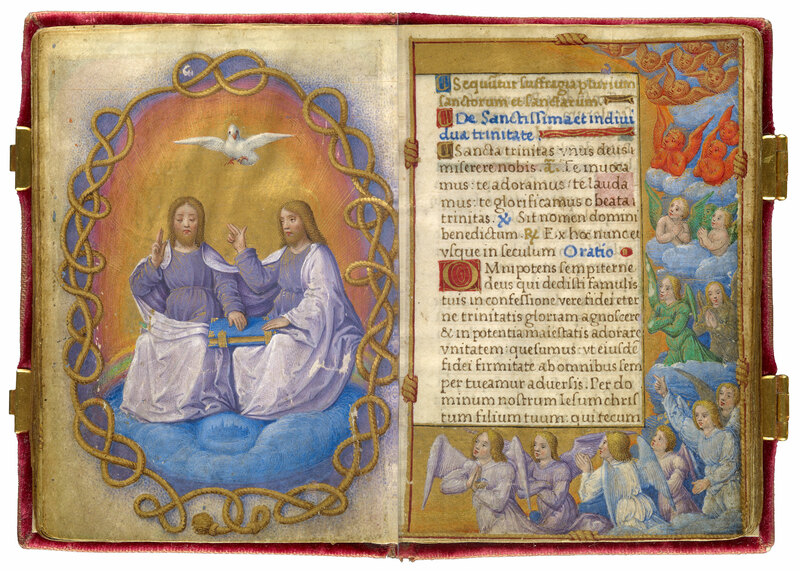 Artist: Master of Claude de France (named after this codex and a companion Book of Hours made for the queen, formerly in a private collection in Paris and now owned by the dealer Heribert Tenschert). The master's identity has been tentatively linked to Eloi Tassart documented in Tours from 1517 to 1528 and called "painter of the queen" from 1521-1523. No works can be definitely ascribed to him however. See R. Wieck, Miracles, p. 58. A censor's notation was added in Spain in the 16th or 17th century on fol. 53v, " [sign of the cross] vistas licen[tia]tus Roche Inqui[s]i[to]r." See R. Wieck, Miracles, p. 24, 26, fig., 32. Bookplate of Alexandre Paul Rosenberg designed by Pablo Picasso inside front cover.